“The world will always need human brilliance, human ingenuity and human skills.” – Brad Keywell, Co-Founder and CEO, Update Technologies. True! The world’s most priceless commodity is indeed, people. 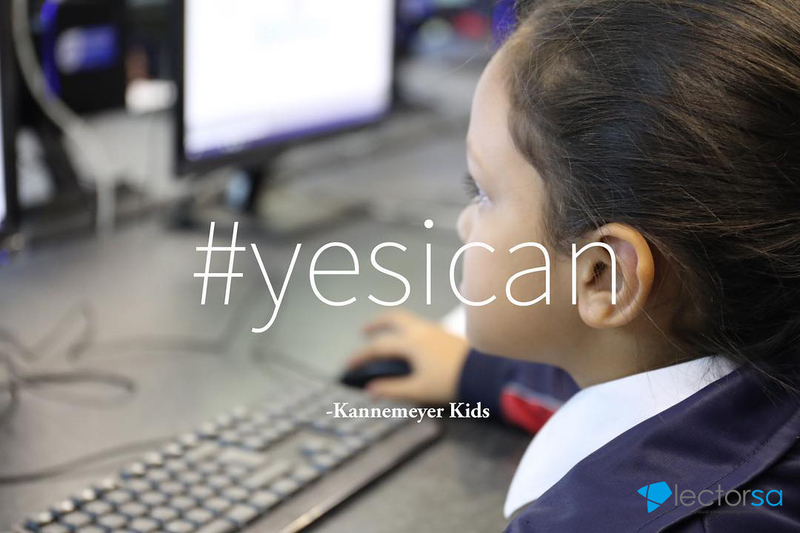 We need to invest in them, inspire them, and empower them to have an ‘I can’ mindset. Currently, headlines in the media are painting a bleak picture of education globally. According to a recent article by Silvia Montoya, Director of the UNESCO Institute for Statistics (UIS), 617 million children and adolescents worldwide – six out of ten – are not reaching the minimum proficiency levels in reading and mathematics. This gives us reason for concern, especially in a time where everything is changing and Industry 4.0 is a reality. However, there is a solution. We (you and I) are the solution. If we join forces we can combat illiteracy and improve educational outcomes across the globe. It can be done. At Lectorsa we have been doing this. ]With our virtual solution, LAB-on-line, we utilize the vehicle of reading and comprehension development to improve visual processing skills and cognitive abilities. We employ the principles of neuromodulation to help readers ‘build’ a structure for interaction with visual information in order to see faster, think better and remember more. Through an online, automated, real-time, data-driven system we achieve excellent results for the personal development of each of our users. Added to that, of course, an improvement in silent reading, fluency (required for learning), language skills and improved academic outcomes. We have successfully ‘rewired’ more than 85 000 minds to learn, retain and to excel! Someone once said, ”A child without education is like a bird without wings.” All of us want to see every child soar to great academic heights. We want to make it possible for them to unlock their true potential and to realize their dreams, for they are our future. At Lectorsa we have seen and experienced the transformation our system brings into the lives of learners across the board. Join us in making the difference the world needs as we improve these crucial skills and results with proven scientific methods. Let’s accelerate and escalate the intellectual capital of our students. 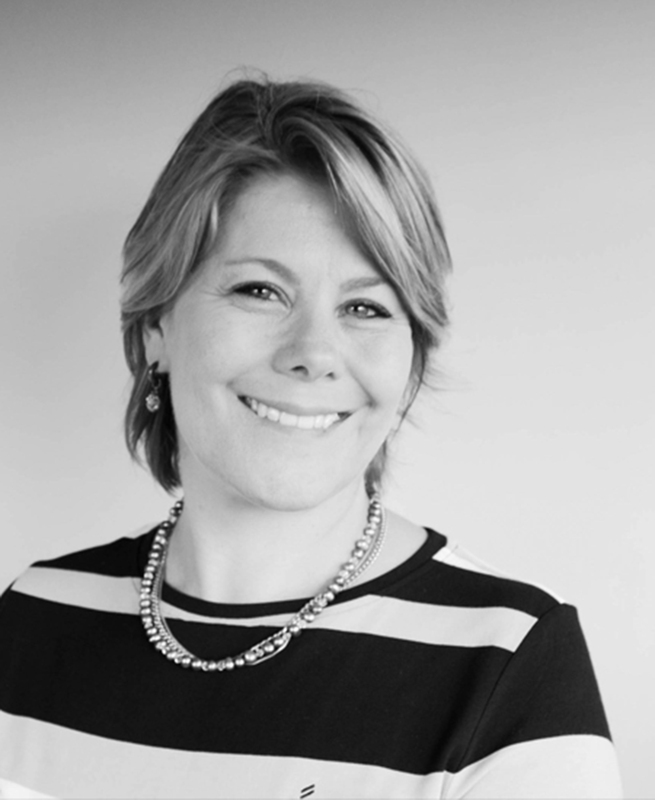 The following article has been contributed by Minda Marshall of Lectorsa, a member of ADESSA. How do you view learning? Do you think of it as “I have to” or as “I want to”? Learning is crucial, but the beauty of learning lies in the love and excitement of growth. As life-long learners we have to keep it real and keep it fun! After more than 30 years of experience in the educational field and first-hand insight as a mother of three, I know how important it is for an educational solution to be more than just an add-on, it needs to ignite excitement. It needs to empower us with more than just skills – we need that added sense of achievement- the ‘magic’ that keeps on drawing us back for more. While developing our virtual solution, LAB-on-line, we kept this in mind and we purposed to create a solution that empowers our users and focuses their attention. We have achieved success because we have currently assisted more than 85 000 users to unlock their true potential, while ‘playing’ at work and working at ‘play’. Learners are under pressure to perform academically and the amount of information that they need to master has increased, but their skillset has not evolved. This has resulted in a GAP that we call the information/application GAP. LAB-on-line develops the skills and gives you the strategies needed to bridge this GAP. It ensures the best personal results and improves excellence in learning without adding more pressure on the student. This year alone, with over 14 000 users on the primary school, high school and tertiary level, remarkable results have been achieved and that within completion of only 5 – 7 lessons. In the Gr 4 division, their Visual Processing Factor (measured in words per minute) already increased from 87 to 130 and their Cognitive Development Factor (measured in % comprehension) improved with 4%. When these learners did the placement test at the beginning of this year, their skill level was below the expected Grade 1 level, but after completing only 5 lessons, their skill level has already increased with two years. We cannot wait to see the improvement after the completion of all 20 lessons. In 2017 the Progress in International Reading Literacy Study (PIRLS) reported that 78% of Gr 4’s in SA cannot read for meaning nor retrieve basic information from the text to answer simple questions. We are turning these statistics around. This year we once again partnered with amazing schools across South Africa and the educators’ dedication and will to bring about real change, in order to empower their students, has been truly inspiring. As stated by the Principal of Kannemeyer Primary School, Ridwan Samodien, we need to be co-travellers on this journey of giving our children the best possible education. Join us in building a better future by investing in our children, because South Africa #YesWeCan! “I’m just here to ask you to do what must be done, to do your part … to make the possible attainable.” These are the inspiring words of Mohamed Sidibay. Mohamed Sidibay was born in Sierra Leone and at age five his country was engulfed in a civil war. Mohamed was kidnapped by rebels and forced to become a child soldier. One night he fled and an Italian priest gave him shelter and connected him to an NGO that links students and teachers worldwide through technology. “Education has offered me choices, chances and challenges. I appreciate the gift of education. I believe that even if we give people the whole world, that world could crumble. But if we give them an education, they can rebuild their world,” Mohamed wrote in an article published in Africa Renewal in 2017. Mohamed’s life story is truly inspiring and once again proves that education is the key to a better, brighter future for all. Change is clearly visible – we equip future leaders with the right set of skills to excel in the 21st century and beyond, but more importantly, we remind them that they are the authors of their own destiny. At Lectorsa, we believe that you are born with everything you need to be exceptional. For this reason, we also applaud Andria Zafirakou, the winner of the Global Teacher Prize award, for being a fellow solutioneer. 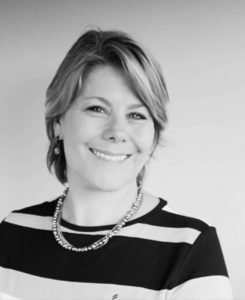 She has helped change the lives of students in one of the UK’s poorest areas, giving them a high level of confidence and a strong chance at a better future. The responsibility we carry for a better future is clear: You and I must become the change! Mohamed and Andria are but two examples of what can be achieved through education. The importance of their journey is the message we have to receive… It starts with us. 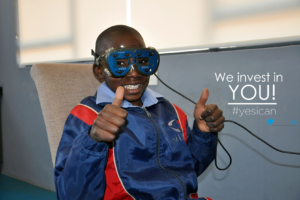 Our vision at Lectorsa is to have our solutions available for EVERY student in all nations, in order to support, improve and develop their Visual Processing and Cognitive Development Factor. This will increase neuroplasticity and enhance creative thinking patterns to develop new knowledge for better solutions. These are exciting times…because across the globe people are busy making the possible attainable. 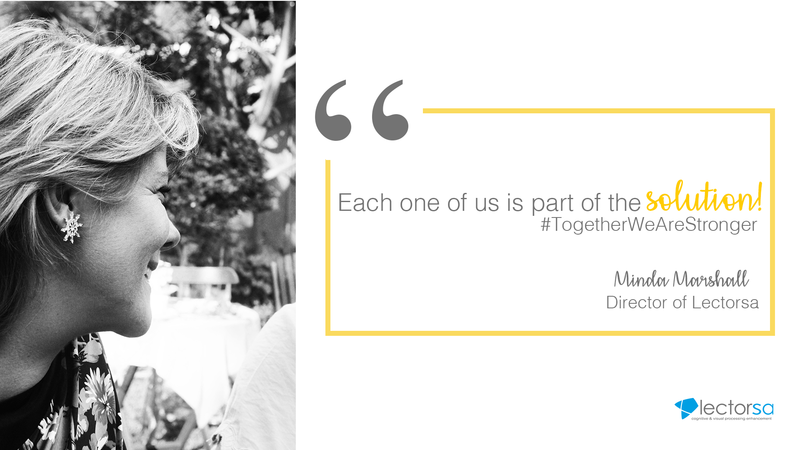 We can change the world … together. The following opinion piece was contibuted by Minda Marshall, co-director and co-owner of Lectorsa, a leading research and development company (based in Mokopane, Limpopo) that supplies solutions internationally to the education and training market. 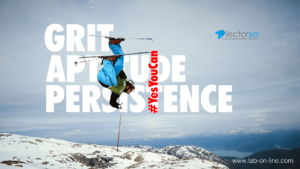 We are already full speed into 2018 and at Lectorsa we believe that this is the year of bigger, better, more. 2018 is going to be the year where we should see an important change in our education system. Last year South Africa was presented with hard facts: A staggering 78% of gr 4’s in the country cannot read for meaning and according to Dr. Nick Spaull, “the ‘real’ gr 12 pass rate for 2017 is around 57% meaning that 43% of the youth in SA still get no qualification whatsoever”. It is also important to realise that quality education is currently a big challenge, not only in SA but also globally. At Lectorsa we are up to that challenge. The World Economic Forum recently predicted that robots could replace 800 million jobs by 2030. These facts and predictions can bring us to a rather gloomy view of the future, however, I strongly believe that we should be very excited about the sweeping changes that are ahead of us. Jack Ma (business magnate, investor, and philanthropist) recently indicated at the recent WEF Conference that as humans we should not try to compete with machines, to clarify, even Usain Bolt won’t be able to outrun a speed train. The changes ahead of us should inspire us to find invigorating new ways of living beneficial and fulfilled lives in the future – and as educators, we should prepare our students for these exciting times. After attending EduTech Africa in October 2017, I was inspired to see thousands of educators from across the country pursuing the latest in teaching strategies, cutting-edge technology and solutions so that they can shape an educational environment that will be more relevant in the 21st-century and beyond. This has just proven once again that there are many people that share our passion for improved cutting-edge education – educators who have a heart for children and who want to stay abreast of times. They want to empower the next generation to look ahead with confidence, knowing they are competent to excel in the workplace. We were in the midst of drafting our 2017 report when the news of the Progress in International Reading Literacy Study (PIRLS) results broke and made numerous headlines: ‘78% of grade 4 pupils can’t read for meaning.’ “This suggests that the majority of learners cannot read well enough to succeed in subjects across the curriculum in Gr 4 and higher grades,” Prof Sarah Howie, National Research Coordinator (NRC) for PIRLS 2016 South Africa, stated. Gr 4’s did the placement test, their skill level was below the expected Grade 1 level, but after completing LAB-on-line, their skill level had increased with 5 years – a year above the expected level. I believe that these results are a powerful testimony to what can be achieved through accurate intervention and development. Thomas Marshall, Co-Director of Lectorsa, recently said, “There will never be a more powerful and opportune time than NOW.” 2018 truly is the year of bigger, better – MORE! Let us create a synergy in 2018 and build a bright future NOW through effective education. Lectorsa, an ADESSA member, asked if lowering the requirements to pass in school, as recently considered by the Department of Basic Education, is truly the answer or are we only fuelling the fire? Today we live in a technology and media-suffused environment with access to an abundance of information and our expectations for students (also in the workplace) have increased dramatically, but our methods of interacting with information have not. Students are already challenged and need improved development of skills and strategies to survive and excel in the environments they will have to function in. Lowering the standard is not the answer we are looking for. Owing to the explosion of data a GAP (the information/application GAP) was formed between the student and the curriculum placing learners, students and our workforce under a lot of strain resulting in poor academics and a decrease in work readiness. We need to bridge this GAP by re-wiring learners minds through developing their Cognitive and Visual Processing Skills and by equipping them with the right ‘tools’ so that they can succeed in this globally and digitally interconnected world. At Lectorsa we have developed an on-line Mind Activation Solution – LAB-on-line, after more than 30 years of research and development, that does exactly that. 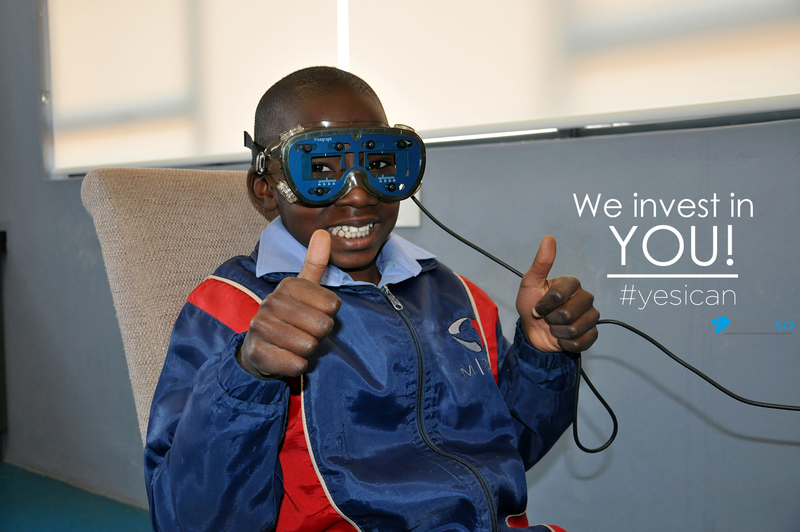 By training and increasing eye-brain performance we produce healthier and stronger minds in our users. LAB helps users to improve and develop skills pertaining to critical thinking, problem-solving, questioning, research, creativity, reading and written communication, to name only a few. This prepares them for a world where change is constant and learning never stops. Life-long learning is the only way to sustain proficient learning in the world we live in today. Never before has it been more important to activate student minds, train and develop accurate ways to facilitate the process of reading and improve comprehension through cognitive development. I stand by my view that the answer does not lie in lowering the pass rate, but in re-imagining our methods of teaching. The Directors of Lectorsa, Thomas and Minda Marshall, firmly believe that to create a better future we must be able to think clearer, as well as read and comprehend better. Expectations for students and people in the workplace have increased dramatically, yet our methods of interacting with information have not. With an explosion of data across the globe, a GAP formed between students and the curriculum – placing learners, students and the workforce under a lot of strain. The world we live in has changed a lot and it keeps on changing; so, it is important to develop visual and cognitive skills. Information is multiplying by the hour and we have less and less time to assimilate and integrate existing and new information. LAB-on-line was created to bridge this GAP and to supercharge the abilities of students and the leaders of tomorrow. 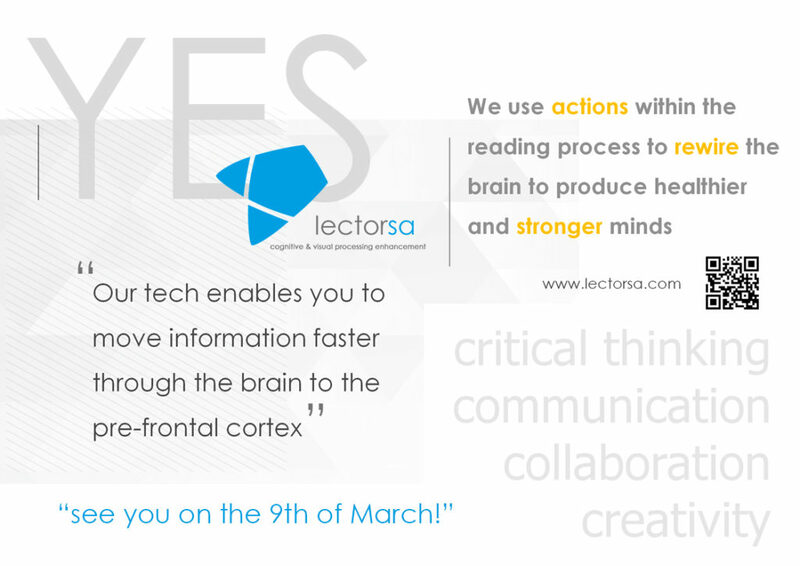 Lectorsa (a member of ADESSA) is a South African-based company that created a Mind Activation System called LAB-on-line. The programme offers the basis to ensure a strong foundation for future interaction with knowledge and information. How many times do you find yourself reading a passage and realising that you did not understand what you read? Or perhaps you cannot remember what you read. The reason for this is that we learn how to read, but we seldom are taught the value of reading-to-learn. It has never been more important to activate minds through training and developing accurate ways to facilitate the process of reading; and thereby improving comprehension through cognitive development. With a proven track record of effective assistance and the development of crucial cognitive skills to more than 68 000 users, LAB-on-line offers the strong foundation that is needed to excel in advanced information processing. The world we live in is changing rapidly, all the time. A young student told me the other day that her final class at university was very insightful: after three years of study the lecturer said that almost everything he taught them is now redundant, so much had changed in the three years they completed their studies. This emphasizes that life-long learning is the only way to sustain proficient learning today. Knowledge and information is exploding across the globe. Never before has it been more important to train and develop accurate ways to facilitate the process of reading with comprehension. Even more, we need innovative ways to teach students how to use current knowledge as a basis from which to create new knowledge. Illiteracy is a leading cause of delinquency, poverty, frustration and depression, resulting in a loss in productivity and general reduction in lifestyles and wellness amongst people in all communities. The current economic situation has made this phenomenon even worse. High-performance environments (work, learning and sport) are here to stay and people require effective solutions, which will give them the opportunity to overcome in life and to contribute by creating a healthy society. We have to face the reality that education is experiencing real challenges: we are training for a future we do not even see and we need to train students for jobs that does not exist in our current framework of mind. 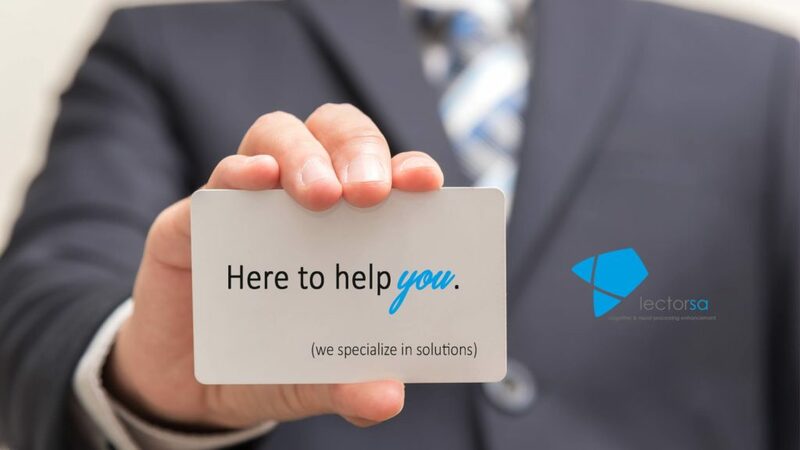 Contact LectorSA for assistance in finding a solution to bridge the gap effectively. Results of more than 49 000 students proves LAB-on-line is a viable solution in 21st Century Learning.